The new era of the measurement of sugar trends has officially started. 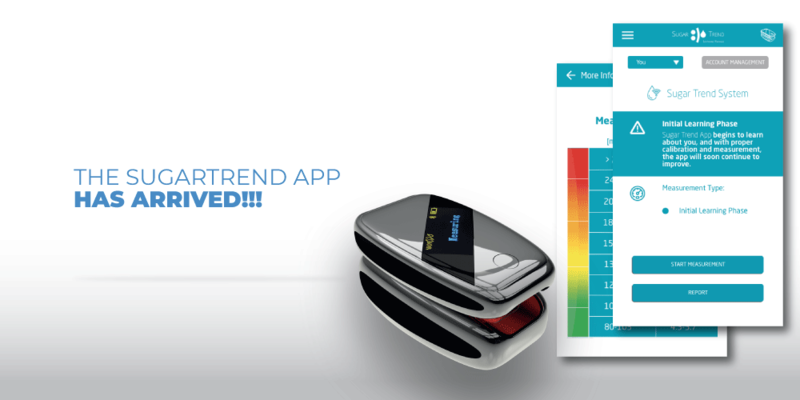 The SugarTrend App is now available for both Android and iOS smartphones in our App Store. For iOS smartphones, you may download the SugarTrend app through the HeloAppStore. For Android smartphones, you may use either the HeloAppStore or the Google Play Store. The App uses a complex algorithm that is able to interpret and evaluate the signals of your Extense device to give you an indication about your current sugar trend. In this Initial Learning Phase, some important calibrations will be required in order to achieve maximum functionality levels, since the Extense is a device with extremely sophisticated sensors. And, don’t forget that this is the FIRST time the world has seen this type of innovative sugar trends measurement technology! Now, it’s your turn to play a strong contributing role in this exciting technological miracle. Your first experiences and testing of this device and the app will be a critically important part of our Initial Learning Phase. This is a key part of the development process of innovative and first-to-market technology. This Initial Learning Phase is integral to the long-term success of this amazing product. This places you at the epicenter of the final development stages of this game-changing product for millions of people around the world. Download the App and start your Extense experience NOW! Please note: When you log-in at the App Store, please use the same App account already associated with your WGN profile. Or if you need to create a new account, connect it to your WGN profile in order to use the App.